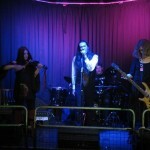 Our first gig! Totally over-excited, we bundled ourselves into random vehicles and launched into orbit around Leeds’ one-way system, trying to find the venue. It turned out to be under a huge GPS-blocking railway bridge – the Dark Arches – which we thought was an awesome and suitably atmospheric address for our debut. Loading in, it became apparent that the stage was upstairs, whereas most of the audience was downstairs. Odd. We also found that we were the only rock band on a bill otherwise occupied by acoustic guitarist/vocalists. More odd. Still, this was our first gig, and we weren’t about to be put off by such details. The bank-holiday chill-out vibe was about to go up in smoke! Needless to say, we rocked. Which is to say, we got some polite applause and nobody threw anything at us. Well, the important thing is that we didn’t put anyone off their beer, nothing caught fire and after an initial bout of nerves we actually rather enjoyed ourselves! Pretty good for our debut outing I reckon. So thank you Leeds for nursing us gently through our first time. We’d love to come back soon if you’ll have us. Get in touch!